Britannia winning the Royal Clyde Yacht Club’s Queen’s Cup, Firth of Clyde, July 1894. Probably G.L. Watson’s most famous and successful design, the cutter yacht Britannia was launched 20 April 1893 at D.&W. Henderson’s Meadowside Shipyard, Partick, Glasgow. It’s where the River Kelvin meets the River Clyde, opposite the present day Riverside Museum. She was designed by Watson for the Prince of Wales, and was to become one of the all time most famous and successful racing yachts. We chose this photograph by Adamson of Rothesay for the dust jacket of Martin Black’s biography, G.L. WATSON – THE ART AND SCIENCE OF YACHT DESIGN. 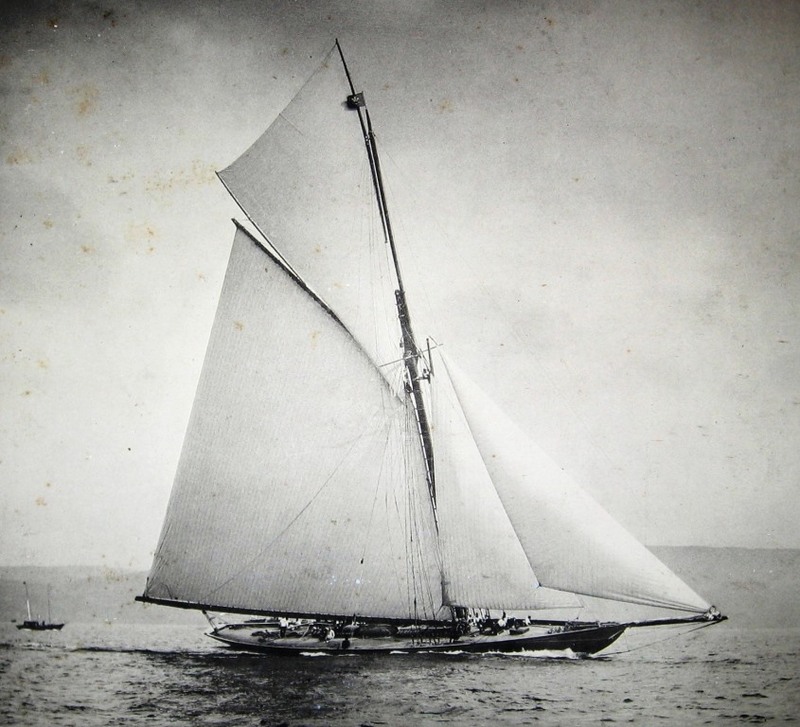 It’s an image that seems to sum up the grace and efficiency of this rather special yacht as she glides over the waters of her birth with the minimum of fuss – along the way beating an American visitor to the Clyde Fortnight, the previous autumn’s America’s Cup defender, Vigilant, designed by Nathanael Herreshoff. 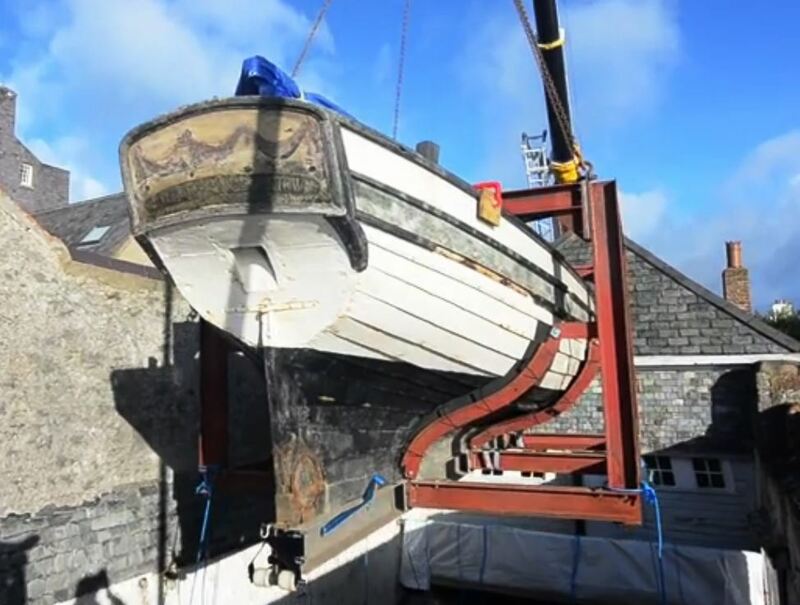 It was an emotional moment this week when Peggy, probably the world’s oldest yacht – born 1789 – departed her boathouse at Castletown on the Isle of Man for the first time in c200 years – vertically, instead of horizontally. She’s moving to a more suitable site for essential conservation work. The full video of the lift out is here. Thanks for heads-up to Afloat Magazine, where W.M. “Winkie” Nixon has been a longtime Peggy fan and evangelist. Her National Historic Ships UK Register entry is here. And her excellent conservation blog is here. The most recent episode in Alastair Gordon’s eloquent retracing of his father’s pre-second word war life in Scotland. 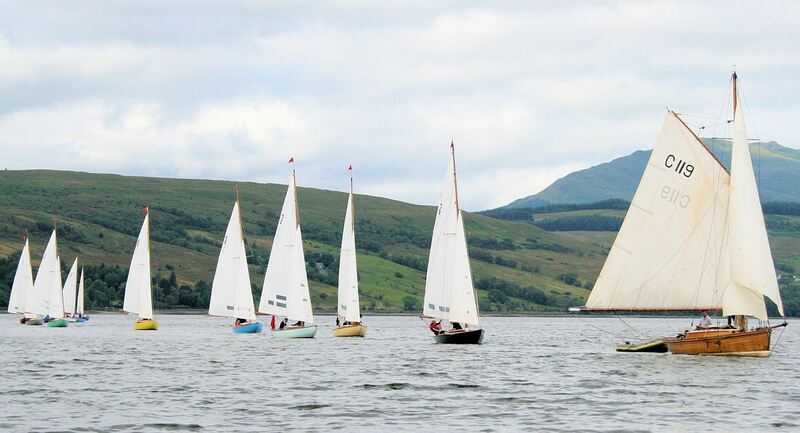 We enter a carefree summer of sailing beautiful home-grown yachts on the Firth of Clyde – the Gareloch in particular – and the west coast of Scotland; the last such summer for a long time, even forever. Read here. 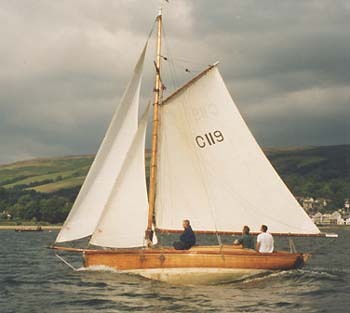 Ian Nicolson with G.L. 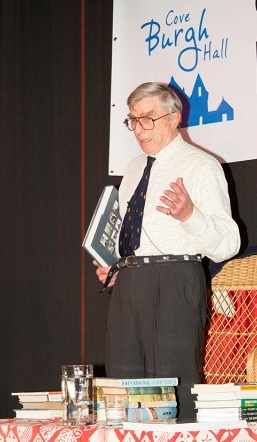 Watson – The Art and Science of Yacht Design at Cove & Kilcreggan Book Festival, November2014. It’s pleasing to hear about yacht designer, surveyor, sailmaker, yachtsman, paragon of octogenarian health and prolific author of really useful yachting books, Ian Nicolson, rubbing shoulders with fellow media and literary ‘heavyweights’, Sally Magnusson, James Robertson and Kirsty Wark, at the recent Cove & Kilcreggan Book Festival, Argyll, Scotland. And great to see Ian holding forth with Martin Black’s G.L. 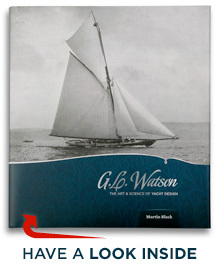 Watson – The Art and Science of Yacht Design tucked under his arm. After apprenticeship in England with Poole-based yacht designer and builder, Frederick R. Parker, gaining experience with Thornycrofts and working for Thorton Grenfell in Canada, Ian joined Alfred Mylne & Co. in 1959, eventually taking over the famous Glasgow design office on the death of the 2nd Alfred Mylne, nephew of the firm’s founder who had shocked his mentor, G.L. Watson, in going it alone in 1896. Amongst his varied day work – he has never really retired – Ian has somehow found the time to write, so far, 23 books mostly on yacht design, construction and surveying, but also popular accounts of the ocean voyaging of his youth. He played a starring role in the BBC film of the Clyde Cruising Club’s 1968 Tobermory Race, narrated by Sally Magnusson’s father, the much missed broadcaster, Magnus. We wrote about it last year in what has become the most popular post at this blog. 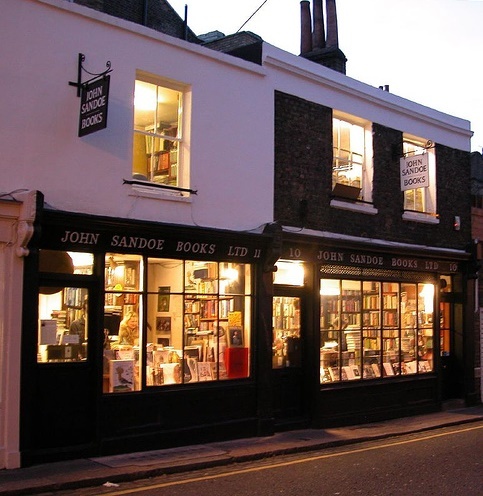 John Sandoe Books, Chelsea: how one would want one’s London stockist to look. We’ve recently been enjoying undertaking a long overdue update to the Reviews page at this blog. As the northern hemisphere days shorten – and more often than not darken – it’s often a time to reflect. This time three years ago, we were approaching the editorial, design and production deadline for Martin Black’s G.L. Watson – The Art and Science of Yacht Design. With the book scheduled to print in Italy during December 2011, and launch at London Boat Show in the first week of January 2012, there’s an intensity to such work that requires a gap in time before one can properly reflect on a job well done. The reviews gathered there are not the result of a selection process for positives. The only chastening comments we receive are from folk impatient to hear news of the promised second volume of drawings accompanied by a more technical appraisal of Watson’s work. We are just as impatient, and will write about that soon. 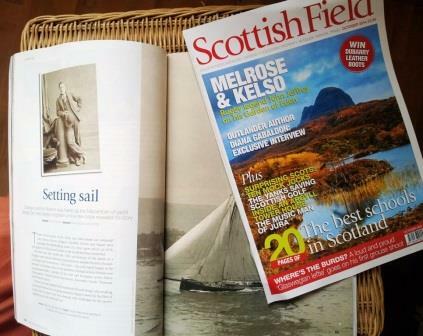 Meanwhile we hope you can enjoy with us some excellent writing by readers and reviewers, known and happy to be not known, about Martin Black’s beautifully written and produced biography of the great Scottish yacht designer, G.L. Watson. And if you are looking for a Christmas present idea for the maritime person in your life, look no further. Buy the book at www.peggybawnpress.com, or from the list of worldwide stockists here. 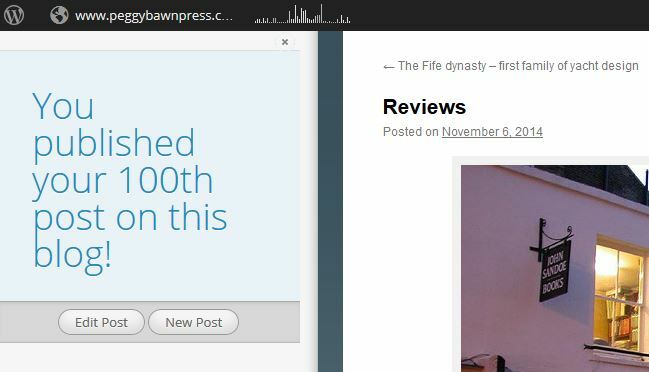 PS: Crikey… apparently this was the 100th post to the blog.